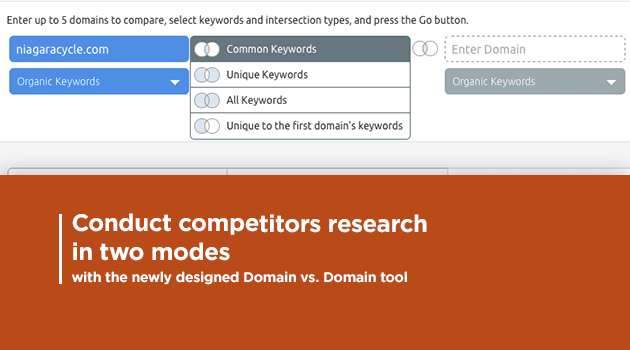 Conduct competitors research in two modes with the newly designed Domain vs. Domain tool! The Domain vs. Domain function, SEMrush’s competitors research tool, has recently gone through a number of changes. Now you can check your competitors’ domains in two modes! Enter websites you’d like to compare (1). Use radio buttons to select the keyword type (organic, paid, or PLA) to see your online rivals’ PPC keywords, organic search terms, or their product listing ads’ ones (2). You will see search phrases that are found on all of the websites being compared (3). For each SEO and PPC keyword or search term that is bringing websites to Google Shopping results, you will find data for search volume, CPC, competition, results, and trends (4), as well as the position (5) websites are getting for it. You can select the Table View or the Chart View (6) by clicking the corresponding tab (7). After you get a rough idea of your and your online rivals’ performance with common keywords, you can deepen your competitive research by clicking the Advanced Mode button (8). View more keywords’ intersections (9) − all domains’ search phrases, each website’s unique search terms, and those that are unique to the website entered in the first input field. The Advanced Mode also allows you to partially visualize data. Just click Enable Charts (7) to show visual representations of keywords’ intersections. By clicking on the areas in the chart that overlap (or any other portions), you can focus on what’s most interesting to your search. 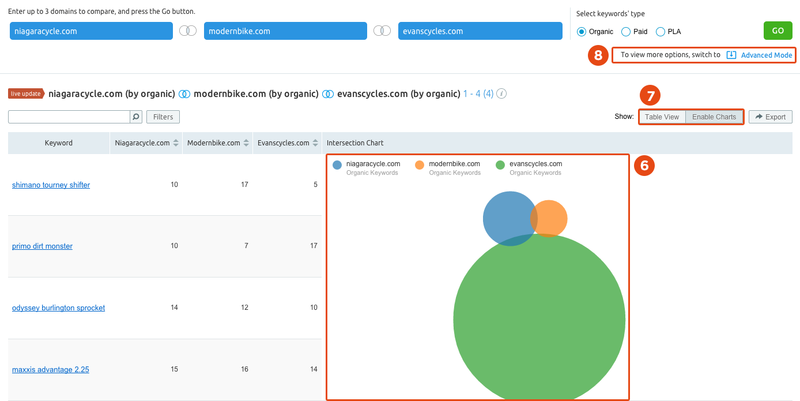 Try out these new research modes of SEMrush’s Domain vs. Domain tool, and choose what works best for analyzing your competitors’ keywords! Monitor what your team is working on with SEMrush Corporate Plans! Track keyword rankings with the redesigned Position Tracking tool!